Charne Bosman ended off another solid racing year with a win at the City Lodge RAC Tough one, crossing the line in 2:10.13 – her best ever, prompting the 43-year-old Nedbank Runner to take to social media. Charne won three marathons building in January and February as part of her preparations for this year’s Comrades Marathon. She crossed the line in 3rd at the Two Oceans Marathon in March this year, and finished 5th at Comrades, before running 16th at the SA Marathon Championships in September (having only started to train in August after Comrades) before running a solid 6th in Soweto. So 2018 will go down as another good year for Bosman. Charne Bosman has been a well-known face on the South African Road Running Circuit for decades. A multiple SA Champion, Charne has also represented South Africa in four occasions, three at the World Half Marathon Championships and 15th place in the 2006 Commonwealth Games Marathon. Since making the jump to the Ultra’s in 2012, Charne has been nothing if not consistent. But in 2012 she was almost lost to the sport. In 2012 she was attempting to qualify for the Olympics in Rotterdam. Her target was 2:36; feeling good, she decided to push for a 2:34 … “but by 22 kilometres, I’d blown it. There is a correlation with form, and there are rules and scales that dictate what you’re capable of. Failing to make the Olympics in 2012 almost ended my running career. I was sad for months after that race. It was one of my biggest dreams, and I didn’t achieve it.” She almost hung up her running shoes after Rotterdam. But after weeks of being in a slump, Charne dusted herself off and started to run again. She made the decision to move up in distance and tackle Ultra Marathons. Her debut beyond the marathon was the 2012 City to City where she finished 2nd. She was hooked. “I had a lot more in the tank at the end. It was only my inexperience beyond the marathon that cost me the win. She was hooked. 2013 she was second at Two Oceans, and 5th at Comrades. The future looked very bright for Charne. Her preparations for Comrades in 2014 were going smoothly and her second place finish at Om Die Dam bode well for the big race. But Comrades turned into a near fatal disaster. With just under 30km to go, Charne collapsed by the side of the road due to a dysfunctional thyroid and was unconscious for a few minutes – finishing the race in an ambulance. “I did not know if I would run again. I had to undergo so many tests and was really scared.” But Charne is fighter and did bounce back in 2015. In fact, she finished second behind the rampant Caroline Wostmann. And then the big break through. Charne won the 2016 Comrades Marathon, passing pre-race favourite Caroline Wostman with 5km to go in dramatic fashion. Wostman had gone out hard and fast and started to cramp with just under 30km to go. Gradually Charne reeled her in, before passing her in the final stages for her biggest ever career win. 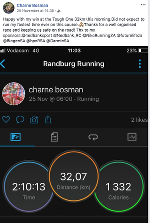 Charne clearly has an affinity for the Comrades Marathon having finished 5th (2013 – debut), DNF (2014), 2nd (2015), 1st (2016), 3rd (2017) and 5th (2018). Consistency defined. If her year-end result at the City Lodge RAC Tough One is anything to go by, then 2019 could be an interesting year for Charne. We will watch this space closely.